Most of us can't stand how wrinkles make us look, but one Texas pup's wrinkles were so "extreme" that he had to have a face-lift to be able to see. 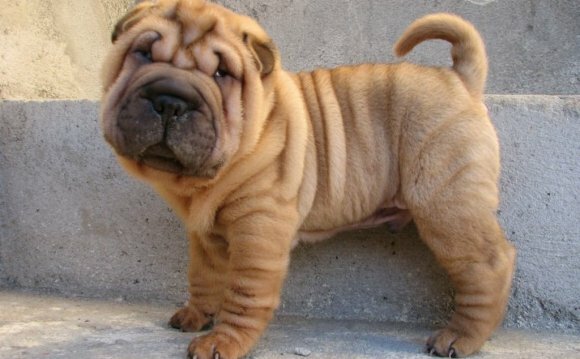 Shar-Peis' fuzzy facial rolls give the Chinese breed its signature adorable look. But the San Antonio Humane Society said 2-year-old Sesame had so many wrinkles on his face he was basically blind. His wrinkles also covered up his ears, causing infections (Shar-Peis are very susceptible to getting yeast infections in between their rolls). "It's not uncommon for Shar-Peis to have vision problems related to their wrinkles covering their eyes, but this was an extreme case, " said Seamus Nelson, the director of communications for the Humane Society. "It took a little bit of assessment to realize that he cannot see and he smelled horrible." The dog, who is described as sweet and playful, was first brought into the city's Animal Care Services in February and then transferred to the Humane Society for care. Although the Humane Society, which cares for 185 to 200 dogs and cats, is a nonprofit organization, its Michaels Medical Rescue Fund is set up to treat special needs animals. Nelson said the Humane Society didn't know who brought in Sesame, but he wouldn't be surprised if someone had bought him from a breeder and then gave him up. "It may have been too much of a challenge, " he said. "Shar-Pei puppies … they're adorable, but then they grow." Sesame underwent two facial surgeries, one in February and a second one in March, to remove "inches of skin" from around his eyes, which allowed him to see for the first time in his life, Nelson said. He also had his ears pinned back to "allow more ventilation, " which should reduce the chances of infection. It's not unusual for Shar-Peis to have the face-lift procedure, called entropion, but Nelson said usually veterinarians remove one inch of skin, not several, as with Sesame. "The rolls will cause the eyelids to grow into the sockets rather than over the eyes, and that is what causes damage to the eyeballs, " Nelson said, adding that with Sesame's case, it seemed like a case of bad breeding. "Some breeder got a little wrinkle happy and bred wrinkles upon wrinkles upon wrinkles, " he said. "[The facial surgery for Shar-Peis] is very rarely done to this extreme." The Humane Society announced last week that the little pup was successfully recovering. Nelson said Sesame's vision was damaged and his eyes were underdeveloped from not being able to see for so long, but he was more playful than ever. "He can basically see what we are assuming is shadows … but he can definitely see now, " he said. "He's just so happy to be outside. Imagine not being able to see for your whole life and then suddenly being able to. I'm sure it was initially overwhelming." Sesame was adopted Friday by a San Antonio woman who told the shelter she saw his story on the news and fell in love. The Humane Society identified her only as Teresa but said she had owned several Shar-Peis in the past.